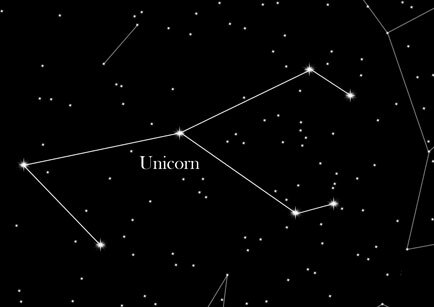 The constellation "Unicorn" is to be found south of the celestial equator and is relatively inconspicuous. However, benefited from the Unicorn during the bright band of the Milky Way, which crosses the unicorn. Many nebulae and other objects of observation make the Unicorn very interesting for astronomers. The Unicorn is found east of the constellation Orion and north of a bright star in Constellation "Big Dog". The constellation only contains two stars with magnitude 4, but are beautiful objects from the same observation bright band of our Milky Way. Thus, for example of the open cluster M50 very admirable and well-known "Rosette Nebula". The head of the Unicorn is made up by a triangle and one can also see the front half of the front hooves. The unicorn is not one of the 48 ancient classical constellations, so it has no mythological background in which the gods are said to have denied fighting or won victories.